This series was painted almost entirely in my bathtub or bathroom. It began as a way to continue painting right after the birth of my daughter. I was surprised to find the constraints of this series, such as time, water, and gravity, helped me focus, and in the end to see in a different way. I found many similarities between this project and painting plein air. Starting at “the Forks” in Winnipeg, where the Assiniboine River meets the Red River, I go door to door along the Assiniboine to gain permission to paint the private view of the river from these sites. The plein air landscapes, viewed from windows within strangers’ homes and businesses, serve as maps, documenting both the physical passage of time interwoven with the social implications of being in inaccessible spaces. May 24, 2013 by Ty Johnston. I lived in an apartment on this one block street, Woodrow Place, along the Assiniboine River in Winnipeg. Somewhat dilapidated, all of the homes on the street had private riverfront access. I painted the views of the river from my neighbours homes. All of these homes were owned by one person who recently sold them with the intention to build riverfront condos. Before impending eviction, we threw a block party to celebrate the people who live here. The painting surfaces are found corrugated sign board, often used for real estate signs, and were installed in corresponding front yards for the block party. May 23, 2013 by Ty Johnston. 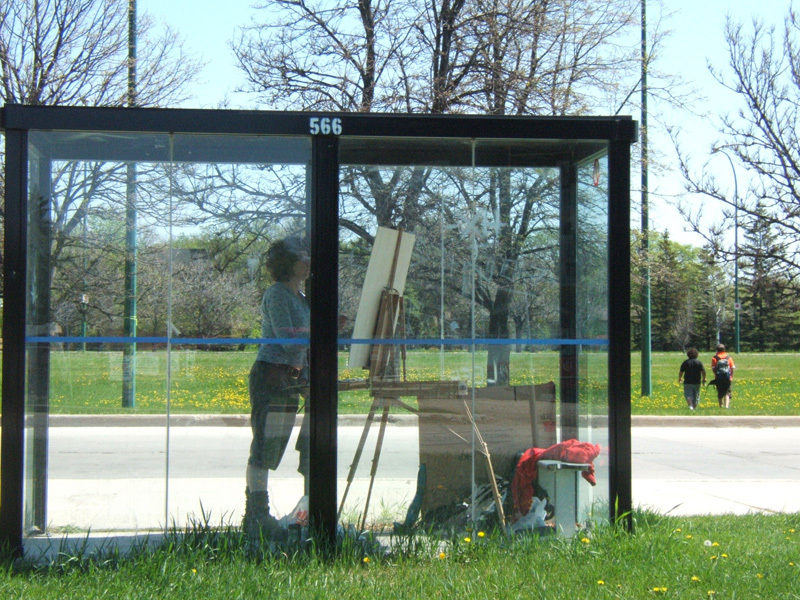 The glass boxes of the Winnipeg bus shelters are the ideal plein air studio, and the bus routes a structure to understand the city by. May 21, 2013 by Ty Johnston.